The education sector has undergone significant changes in the last decade. It has also evolved rapidly with the changes taking place in the digital world. Today, you would find most of the schools and universities using digital aids in classrooms. By incorporating technology into K-12 education model, institutes are aiming to improve the teaching and learning processes in schools and universities. 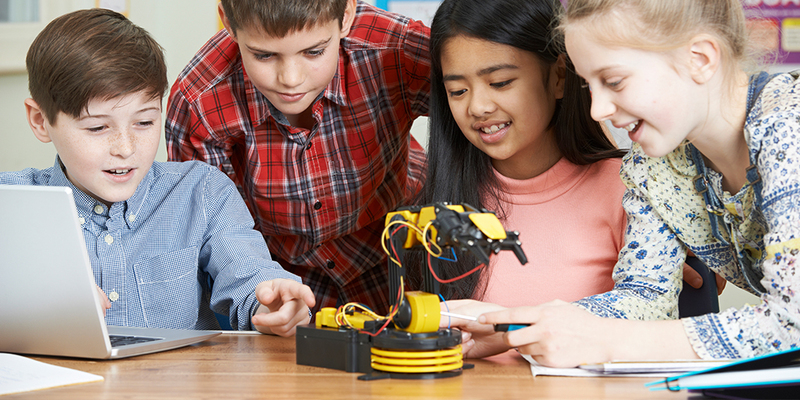 The reason why K-12 is given so much importance is because these are the formative years where students are encouraged to think out of the box, learn to analyze and solve problems, make decisions and come up with innovative ideas. In order to empower them to do so, we need more engaging teaching aids than just an instructor-led classroom. Innovative methods are being sought out to help students excel and achieve overall development. That is how technological innovations made their way into classrooms; to help students develop a deeper understanding of subjects and improve the learning experience. Flipped classroom means a learning model where students go through their study materials at home and do their assignments in the classroom. Students have gotten used to the idea of doing homework at home, while they read the chapters and make notes in the classroom. With the flipped approach, teachers aim to make the learning process more engaging. The objective is to keep them active in the classrooms by engaging them with in-depth discussions and activities. Students can watch video-based learning content, research external web links etc., at home or anywhere they want. But in the classroom, the instructor would guide them and engage in practical learning with experiments, group discussions etc. This method places emphasis on keeping students engaged in the classrooms. And for this, teachers use various means such as augmented reality, interactive eBooks, or conduct pop quizzes, give group assignments. Classrooms become a place for interactive learning where students can apply the concepts, they have learned online, while the instructional part, like watching or reading the course materials take place outside the classroom. It provides students an opportunity to study independently at home and increase their practical knowledge along with their communication and collaboration skills in the classroom. Audiobooks have enabled students to listen to their learning material. Students who are unable to read due to various physical challenges such as dyslexia, visual impairment etc., can benefit from audiobooks as they can listen to their course materials. Even otherwise, students without any particular challenges can also listen to audiobooks, as it helps in improving their vocabulary when they listen to pronunciations. Audiobooks provide a sensory experience, keeping students engaged and helping them retain information. Similarly, dictation software has proved beneficial to a lot of students and teachers. It assists students with a physical injury or some disability which refrains them from writing or typing. It helps students with correct spellings and reduces the time taken to create notes. A lot of students with physical disabilities use the dictation software to access their computers independently. These supporting software help provide a personalized learning experience. A digital content library is a repository of study materials like instructional videos, audiobooks, reading materials, practice assignments etc. It is a virtual library consisting of interactive learning nuggets which keeps students engaged in the content. Teachers can use these resources to explain concepts effectively and maintain interactivity in classrooms. You can find learning resources of different subjects such as mathematics, science, languages etc. A digital content library can contain thousands of learning nuggets, offering a wide array of resources for students to enhance their knowledge. The learning materials available in these libraries are usually embedded with interactive and multimedia content to increase student engagement and help them retain information. Educational institutes can use these digital content libraries as part of their course modules to enrich the teaching experience. These online resources are usually mapped to the curriculum that is approved by the school board. You can also customize your content library if needed, according to your course requirements. The content can be made available in multiple languages as per your region-specific requirements. One cannot ignore the importance of social media. Although it is not an innovation made particularly for educational purpose, it has certain features which proves helpful in the learning process. From being an online platform to kill time, social media has evolved into one of the effective mediums to collaborate and interact. Students usually spend a lot of time on social media. According to a study, 41% teens admittedly spend too much time on social media. Hence, K-12 institutes are slowly including social media features into their eBooks to increase collaborative learning. The social sharing feature is used to allow students to share content with their peers. They can post content, like and comment on each other’s posts. Creating a dedicated social media page for your institute will encourage students to interact with their peers on the online platform. They can post questions and doubts and receive multiple answers from different people including teachers. This interaction through a social platform creates an informal rapport, creating a supportive and positive student-teacher relationship. Simulation exercises are done on a digital screen, where the user can control the actions. It’s like playing a video game where you are in control of whatever happens in the game. Only difference here being that these games are created keeping in mind the educational requirements of K-12 students. Simulation provides a virtual outlook of a real-life situation. It helps students to better understand the concepts by actually being part of the process. Institutes are incorporating virtual scenarios as part of the course module to keep the learners engaged in the classroom and help them learn better. Simulation imitates real-world activities and processes in a safe environment. After the recent school shooting incidents in the US, many schools and universities have implemented simulation programs for teachers and students. This program was created to prepare everyone for the worst and to escape safely in case a similar situation arises in future. In a simulated environment, people have the option to try alternative strategies and approaches. This helps them to understand which approach works best and which doesn’t. In a simulated learning environment, students are allowed to make mistakes without any serious implications. It gives them an opportunity to analyze and make decisions, improving their problem solving and critical thinking skills. This emerging and immersive technology is being put to effective use in the K-12 education system. In augmented reality, computer generated graphics are overlaid on images of the physical world, augmenting the reality with digital images. For K-12 students, finding enhanced visuals of plain images on their mobile screen makes for a fun and engaging learning experience. For example, in a science class, students can club multiple chemicals into different combinations and find out what happens when they are mixed together. They may not have the liberty to try out these experiments in their science labs, but AR provides them with this experience on their mobile screens. And they don’t even have to be in the classroom to experience augmented reality, they could be sitting in a park, in the library, coffee shop etc. Students only require an AR enabled app and an image or flash card which triggers augmented reality on the device screen. Virtual reality goes a level beyond augmented reality. It not only displays enhanced visuals, but makes the user believe that they are present in different world altogether. Virtual reality replaces the physical world with a digital experience. This technology is best used to show places of geographical or historic importance. Instead of arranging a field trip for the students, teachers can make them wear head mounted displays which gives them a view of the real location. Although the equipment used for virtual reality display might be a little costly, you get to provide your students an immersive learning experience which will benefit them. Teach them about the pyramids of Egypt, show them the interiors of the pyramids without stepping out of the classroom. This style of teaching helps students to grasp concepts more effectively and retain the information. With 3D visuals and audio, the wearer of the VR display would be transported to an artificial world, providing a highly sensory experience. The recent years have seen many innovations in the field of technology. A lot of these innovations can be leveraged effectively in K-12 education. Today, the curriculum is designed in such a way that the concepts that are taught can be applied not only in classrooms but also in real-lives. K-12 students now have the opportunity to explore and enhance their knowledge with multiple digital resources to support them in their learning journey. Educational institutes are incorporating the top trends in technology in order to improve the way subjects are taught as well to enhance the learning experience. By using multiple digital techniques that can provide an intuitive and immersive learning experience, you can provide the best opportunities for effective learning.